In 2003, Chris graduated with a BMus (hons) degree from Trinity College of Music. At this time Chris was introduced to one of his greatest passions within his field; percussion instruments and music from around the World. This particular type of specialist playing led him to working with the BBC Symphony Orchestra, BBC National Orchestra of Wales, The Royal Shakespeare Company, and the English National Ballet. Chris is currently a freelance musician in London, and performs in West End shows such as ‘We Will Rock you’, ‘Wizard of Oz’. He is in great demand in the world of recording sessions and performs regularly on different sessions with pop groups, orchestras and on various film scores. He has recorded albums with the Royal Philharmonic Orchestra, Sam Sheppard for Radio 1, Hayley Westerna, to name a few.. Chris has also performed extensively on the Welsh Television Network S4C and for Katherine Jenkins’ TV broadcasts. 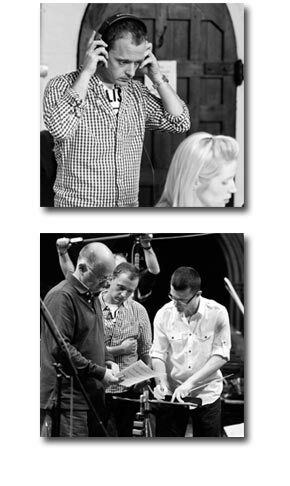 Chris as a varied and extensive portfolio of compositions, including ‘Heartstrings’ which was recorded for Classic FM/Decca recently, this will be featured on the new album - Girl With the Golden Harp, featuring Claire Jones and the English Chamber Orchestra. In addition to his work as a composer, he also arranged and orchestrated 10 tracks for the album of well known themes from the classical music world and some famous Welsh folksongs for solo harp and orchestra. Chris has also composed music for TV adverts including a track for Clogau Gold the Welsh Jewelry Company who made the Royal wedding rings for TRH The Duke & Duchess of Cambridge which is shown internationally. He also composed music for the advert ‘Fishermans Friends’ currently shown in the USA. Future plans include the release of new album by Classic FM/Decca - “The Girl with the Golden Harp” on September 3rd and debut CD release for C2 duet. Continued performances throughout the country’s Music Festivals, performances in the West End, and ongoing recording sessions with 'Floating Points' for EMI. Chris and Claire will be getting married 5 days following the release of their CD on September 8th 2012. The Girl with the Golden Harp - all arrangements and orchestrations on the Album. Written for Solo Harp with Strings.